The young woman with a remarkable history of serious adverse effects from multiple trials of psychiatric medications for anxiety recently asked me this question. This post summarizes the results of a thoughtful literature search using the UCSF medical library, data from the Medical Affairs departments for two of the TMS manufacturers, and clinical experience at Lenox Hill TMS, where my TMS practice is located. First, a warning. 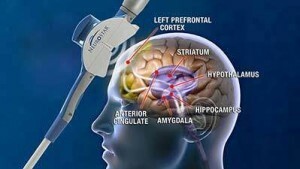 The information contained in this post discusses “off label” uses of TMS. Meaning that, in the United States, no device is approved by the FDA for use in treating anxiety disorders. Second, some important context about anxiety. Anxiety takes many forms and has many different kinds of relationships with depression. It may be useful to review the information on this page that discusses some of those complexities. It is also important to note that anxiety levels vary from hour to hour and day to day much more than depression severity, and may be more responsive to environmental influences, meaning that it is especially important to look at possible placebo responses to treatments. In general, almost none of the studies using TMS for anxiety have involved the use of “sham TMS” and thus placebo response cannot be ruled out. Finally, a note about TMS. Transcranial magnetic stimulation (TMS) of the brain takes many forms and the response to TMS depends on several factors. Magnetic coil type – Each type of TMS machine has a different magnetic coil, and the type of coil affects a number of important parameters. To site two examples, the first approved device in the United States, the Neurostar device from Neuronetics has a figure 8 coil which provides a relatively focal stimulation of the brain, whereas the Brainsway device has an H shaped coil which stimulates a much wider area. Location of stimulation – Most of the clinical trials of TMS involved stimulation of the left dorsolateral prefrontal cortex (left DLPFC), but many of the clinical trials for the treatment of anxiety look at stimulation of the right DLPFC. There is some evidence to suggest that the effects of right and left DLPFC have somewhat antagonistic facts. And it is worth noting that in some clinical trials of TMS for off label uses stimulation takes place at other far removed places on the cortex. For example the orbitofrontal cortex for obsessive-compulsive disorder. Frequency of stimulation – Most of the clinical trials of TMS used “rapid” stimulation of the cortex at a frequency of 10 Hz. Many of the trials using TMS for anxiety involved “low frequency” TMS at 1 Hz. There has been some suggestion in the literature that these two frequencies also have somewhat antagonistic effects. 1 Hz stimulation has been proposed to exert an inhibitory effect on cortical activity whereas 10 Hz stimulation has been proposed to exert excitatory effects. Thus, in a vastly oversimplified view of the effects of TMS, right 1 Hz stimulation of the DLPFC has somewhat similar effects on the brain as left 10 Hz stimulation of the DLPFC (See George, et al, 1999) . The Schutter article was one of the first articles to point to 1 Hz right DLPFC stimulation as an potentially effective treatment for anxiety. Since then other studies have been published looking at the use of TMS for “anxiety disorders” of various kinds. The majority of studies have looked at TMS for the treatment of PTSD, panic disorder, and obsessive-compulsive disorder. A few studies have looked at TMS for social anxiety disorder and generalized anxiety disorder. A number of larger trials have been conducted, the majority using right DLPFC stimulation. Three placebo controlled (sham TMS controlled) studies of roughly 20 patients each found that 1 Hz right DLPFC reduced core PTSD symptoms. One sham controlled trial found that left 10 Hz DLPFC was effective for core PTSD and associated depressive symptoms. The Berlim and Clark articles provide in depth reviews of this topic. A Cochrane review of TMS in Panic Disorder provided more information about the use of TMS in anxiety disorders. Two trials met basic criteria for validity and those two trials used the MagStim device (more similar to Neurostar’s) with a 1 Hz protocol for two weeks over the right DLPFC and found short term reductions in symptoms. One of the studies found that active treatment was more effective than sham treatment and one of the studies found no difference. As far as I can tell, there is no published data on the Brainsway machine (deep TMS) in the treatment of generalized anxiety disorder. There is one case series from Sarit Hovav of deep TMS for comorbid anxiety and depression. George, M.S. ; Stallings, L.E. ; Speer, A.M.; Nahas, Z.; Spicer, K.M. ; Vincent, D.J. ; Bohning, D.E. ; Cheng, K.T. ; Molloy, M.; Teneback, C.C. ; Risch, S.C. Prefrontal repetitive transcranial magnetic stimulation (rTMS) changes relative perfusion locally and remotely. Hum. Psychopharmacol. Clin. Exp., 1999, 14(3), 161- 170. Schutter DJ, van Honk J, d’Alfonso AA, Postma A, de Haan EH. Effects of slow rTMS at the right dorsolateral prefrontal cortex on EEG asymmetry and mood. Neuroreport. 2001 Mar 5;12(3):445-7. PubMed PMID: 11234743. Jenkins, Jenny, et al. Right and left prefrontal transcranial magnetic stimulation at 1 Hz does not affect mood in healthy volunteers. BMC psychiatry 2.1 (2002): 1. Kauffmann CD, Cheema MA, Miller BE. Slow right prefrontal transcranial magnetic stimulation as a treatment for medication-resistant depression: a double-blind, placebo-controlled study. Depress Anxiety. 2004;19(1):59-62. PubMed PMID: 14978787. Paes F, Machado S, Arias-Carrión O, Velasques B, Teixeira S, Budde H, Cagy M, Piedade R, Ribeiro P, Huston JP, Sack AT, Nardi AE. The value of repetitive transcranial magnetic stimulation (rTMS) for the treatment of anxiety disorders: an integrative review. CNS Neurol Disord Drug Targets. 2011 Aug;10(5):610-20. Review. PubMed PMID: 21631403. Machado S, Paes F, Velasques B, Teixeira S, Piedade R, Ribeiro P, Nardi AE, Arias-Carrión O. Is rTMS an effective therapeutic strategy that can be used to treat anxiety disorders? Neuropharmacology. 2012 Jan;62(1):125-34. doi: 10.1016/j.neuropharm.2011.07.024. Review. PubMed PMID: 21807002. Bystritsky A, Kaplan JT, Feusner JD, Kerwin LE, Wadekar M, Burock M, Wu AD, Iacoboni M. A preliminary study of fMRI-guided rTMS in the treatment of generalized anxiety disorder. J Clin Psychiatry. 2008 Jul;69(7):1092-8. PubMed PMID: 18572984. Berlim MT, Van Den Eynde F. Repetitive transcranial magnetic stimulation over the dorsolateral prefrontal cortex for treating posttraumatic stress disorder: an exploratory meta-analysis of randomized, double-blind and sham-controlled trials. Can J Psychiatry. 2014;59:487–96.